Maybe some of you know that I am on the lookout for a 4Runner and in the process I found this gem. SUPER CHARGED!! ALMOST 3FT CLEARANCE!! SHOCKED!! STOCKED!! LOCKED!! ROCKED!! Looking for MEGA crawlin machine? This truck is the real deal. This 4runner is ridiculous, stable professional 10" total lift on 38" tires. Ready to tear up any trail. If you looking a monster machine that is a lot of fun to drive on /off trail. Its my daily driver, Real Grenade stick-shift, All around awesome, rhino lined interior/exterior. Comes with tube doors as well as regular. 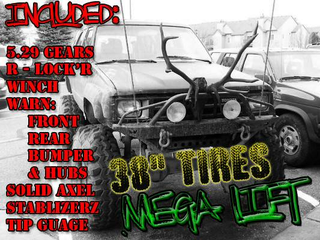 smoke lenses on blinkers, stabilizers, upgraded steering linkage for mega tires, crawling shocks, warn front/rear bumper with lights and hooks, warn manual lock hubs, solid axle swap, Comes with 5.29 gears, rear spindle lock, 4.57 gears, side to side front to back tip gauge. custom welded panels and fenders, All windows in good condition, motor solid running slight forward timing for POWER, EFI engine and more. CB from the shack with dual antennas. Not in a big hurry, just seeing whats out there. Sell or trade, prefer crew cab diesel, or other crew cab but let me know what you have. Coolest truck I have owned, eh still not sure I want to get rid of it. I left off the list of tags that was as long as the ad itself but it did include the terms "low rider".